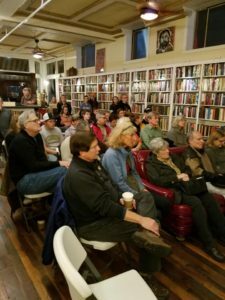 Although Volume III of Everywhere Stories: Short Fiction from a Small Planet has technically been out since mid-October, we held a book launch celebration at Black Swan Books & Music in Staunton, VA on Friday, November 9. The event coincided with downtown Staunton’s Sparkles & Sweets, a pre-holiday promotion that kept stores open late and attracted hordes of shoppers. Despite the competition, however, our event was packed. I didn’t count the attendance, but Jamie, the store owner, had put out all his chairs and there were people standing in the aisles, so we were thrilled. The book, as my readers know, is the third in a series of anthologies. 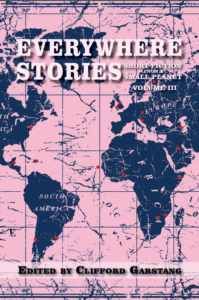 Each volume includes 20 stories by 20 writers set in 20 countries. For the launch, three of our contributors to Volume III were present along with one from Volume II. Each talked and read briefly from their stories and then we ended the program to allow one-on-one conversations and book signings. Thanks to Teresa Hudson, J. Thomas Brown, Mark Jacobs, and Chris Cleary for joining me on the program!